7:34 a.m. Heading out the door, I grab my keys and put them in my right pocket as I always do. My wallet is already in my left pocket, but my cell phone—the final piece in the trinity of pocket necessities—is missing. It is still laying on my bed, where I used it as an alarm clock this morning. Everything in hand, I head out the door. 8:13 a.m. Though 3 teachers are late this morning, I am told I cannot proctor the Samoan language exam because I wouldn’t be able to answer students’ questions. It’s a good point. I head back to my house. 8:14 a.m. En route, I wrestle my keys out of my pocket, only to discover the front door key is missing. I went running last night and took it off the key chain to avoid the others bulking up my pocket. I immediately realize I am locked out. 8:18 a.m. I arrive back at my house after going back to the vice pule to get a knife with which I might be able to jimmy the lock on my front door. I wouldn’t even attempt this in The States, but now that I’ve jimmied the door of my computer lab several times, I’m more confident of my skills. 8:39 a.m. After 10 minutes of unsuccessful attempts of lock-jimmying (in sweltering morning sun, mind you), and my pule insisting he has no key for my house, I am forced to call the Peace Corps. Country Director Dale is currently in The States, so I get acting Director Kelly. “Hi. This is Matt. 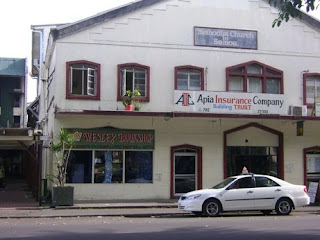 I’m here in Apia, and I am locked out of my house.” The Security Officer would normally handle this situation, but he left to go on vacation yesterday. Kelly says she’ll call me back. 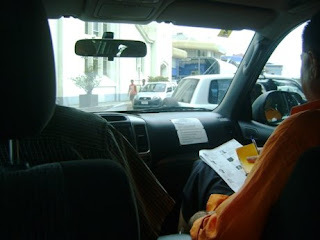 8:50 a.m. Apong, the only remaining Indian missionary, walks over and asks what I’m doing. He thinks my jimmying knife is too soft, so he goes to find a better one. He comes back with a spoon and fork. This doesn’t work either. He goes to find the school groundskeepers thinking they might have better tools. 9:24 a.m. I give up trying to pick the lock with a paperclip I find on the ground. 9:27 a.m. I give up trying to jimmy the lock. I resign myself to the fact I am locked out until after I administer my computer exam. 12:39 p.m. My pule asks how my test went. I tell him it went fine, but I am still locked out of my house. He suggests I call the Peace Corps. I give up on the groundskeeper idea. “Wait. You live close by? I think we may have thought you were someone else this morning.” It turns out they thought I was the other Matt. They have me listed under my first name, which is not Matt. They say they will call me back. 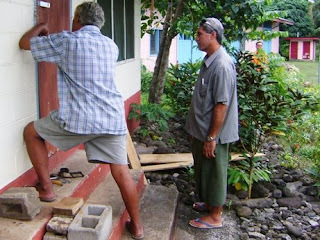 12:47 p.m. Papu, an administrative assistant who works in the Peace Corps office, calls and says he and Tapu are coming to fix my door. 1:04 p.m. Papu and Tapu are unable to fix my door. We hop in the car to go to the locksmith. I sit in the backseat. Something about the dynamic of the car ride feels like I am 5. 1:13 p.m. The locksmith is available, but first must unload the whole fish from his car. We wait. 1:22 p.m. The locksmith is unable to jimmy the door. 1:24 p.m. The locksmith is unable to pick the lock. 1:38 p.m. The locksmith is still unable to do both of the above. 1:40 p.m. 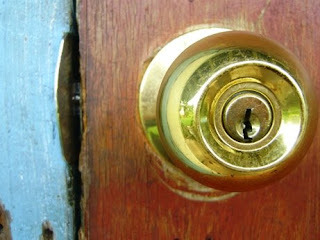 The locksmith pops the doorknob off and is able to open the door to my house. I ask how much I owe him. He says $45. I have $10. 1:49 p.m. The locksmith trusts I will come back to his shop with the money, or he’s not hard-up enough for the $45 to come to the bank. And so ends another day of trying to assimilate and maintain a low profile and failing miserably. I hope you don’t have to deconstruct your locks any time soon. Pictures below. Riding in the backseat with Tapu and Papu. My door, the locksmith, Tapu, and Papu in the distance behind the bushes. Coincidentally, the locksmith is located in this building; the coincidence being I posted this picture yesterday, but yesterday I had no reason to post it. Good to see some things haven't changed. Posting a picture of the locksmith a day early is creepy. hmmm...thinking you should have taken uncle matt up on his offer to legally change your name when you turned 18. hindsight is 20/20 but creepy pictures are priceless. miss you. Your moment-to-moment description had me laughing out loud!